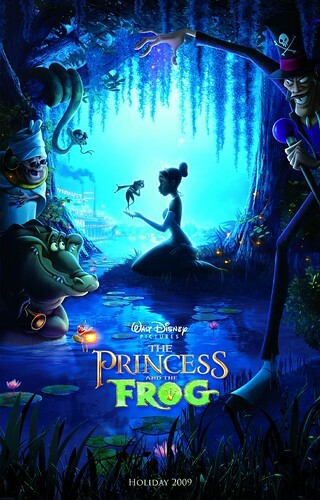 Disney’s new film The Princess and the Frog utilizes classic animation techniques, reviving an art form that put the company on the map. If you look at the latest animation scene – Pixar, DreamWorks – it is all about the computer animation. Every big name, animated feature is in 3-D. With precise modeling or the use of shadow, perspective and movement, animation is created more from software and less from the pencil and pen of an artist. It isn’t a bad thing. The movies from these producers can arguably be considered more entertaining with the effects, and the animation business as a whole is certainly not at a standstill. In the past few years, as we’ve watched the computer animation scene boom, I’ve seen the quality of drawn cartoons go down. I’m not sure if it is part craftsmanship or part laziness, but I’m just a little disillusioned with drawing-based animation as a whole, and part of me wishes the basics were still valued within the greater complex of the entertainment world. Animation is important in the scope of the fine arts. After all, it entails the art of making drawings, paintings and/or clay come to life within the eyes of the viewer. On Dec. 11, Disney will give a long awaited salute to the old animating style, with its newest animated feature The Princess and the Frog. As someone who has lost faith in the quality of Disney’s animation – from the horrendously drawn cartoons on its channel devoted to tween crazes like Miley Cyrus and the Jonas Brothers, all I can say is: It’s about time. Though I am sure the computer was used to create a large portion of the effects, I’m happy to see the original animated style is back in business thanks to Disney. It’s important to appreciate and celebrate the animated films from pre-computer technology. On the trailer for the new film, the company boasted 75 years of animated films, and the directors of some of the older Disney films (the directors who coordinated The Great Mouse Detective, Aladdin and Hercules) managed the making of this feature. Disney’s Home on the Range is dubbed the last 2-D animated feature to come out of the Walt Disney Animation Studios, and the old style’s return seemed to come as a surprise to some Disney artists. In an interview with Animation Work Network last fall, Princess animator Andreas Deja said he had recently finished work on an animated short, How to Hook Up Your Home Theater – which West worked on as well – in preparation for The Princess and the Frog. Princess animators mixed traditional pencil and paper techniques with computer technology. But Deja said it did not take away from his role as an animator. Despite the film’s help from computers, I’m excited to see the hand-drawn style directors John Musker and Ron Clements demanded. I am hoping since Disney has helped renew appreciation for the hard work of hand-drawn animation, other producers will follow suit. The basics hold a lot of value and should be respected. This goes for everything within art, and we can’t learn how to advance in our own techniques until we have become experts of the techniques of the past. We also can’t rely solely on the computer to produce art and animation. We at least have to learn how to do things the old fashioned way. I encourage you – and possibly your inner child – to enjoy the traditions of good old animation by seeing The Princess and the Frog, a Disney film that may help set an artistic example once again. The Franklin Institute will soon host a celebration of Disney’s history.